For the longest time we only knew that Peter Jackson was co-writing the screenplay and directing it…Finally now, we get some news on the cast for the Lovely Bones. Yes finally. Rachel Weisz will play Susie’s mother and Ryan Gosling will play Susie’s father. Interesting choice. Its been a good 2 years or more since I’ve read the book…so as usual I can’t remember the exact details and all…but I imagined Susie’s father to be slightly older…Maybe around mid 30’s early 40’s…when Susie died (I might be wrong though)…Ryan Gosling is just way too young…oh well I guess they will try to age him…give him a couple of wrinkles and a scruffy beard. Other than that …They’ve had some very capable actors on board. Now who will play the all important children characters, Lindsey, Buckley, Ruth and Ray? Seems like the film will open at the Venice Film Festival this August…but the rest of the world will only get to see it around September to December. I do hope it does get a released in Singapore. For now we only have the pictures to view. There’s been quite a lot released…I’m putting all the links I’ve found here for your viewing pleasure. Enjoy..
View trailer here. Ok…I kinda like the poster. The icy blue shades…kinda makes you think its a Snow Queen movie of some sort…and the huge polar bear reminds of those polar bears in Chronicles of Narnia. The trailer…hmm didn’t really like it…again looks too much like Narnia…from the colours…the effects…even how the animal looks like…Neither can I really get what the movie is about…and from my perspective…it looks all too similar to Narnia. Sure the poster and trailer looks pretty and all…but overall it doesn’t really grab me. View the trailers here and here. Ok I love period/costume dramas. I love the effort trying to keep the language/settings/costumes true to the era. And I’m really looking forward to this. I like the trailers and all. The scenes look pretty…of course it definitely reminds me of Mansfield Park and Pride and Prejudice…I hope its as good. View the trailer here. 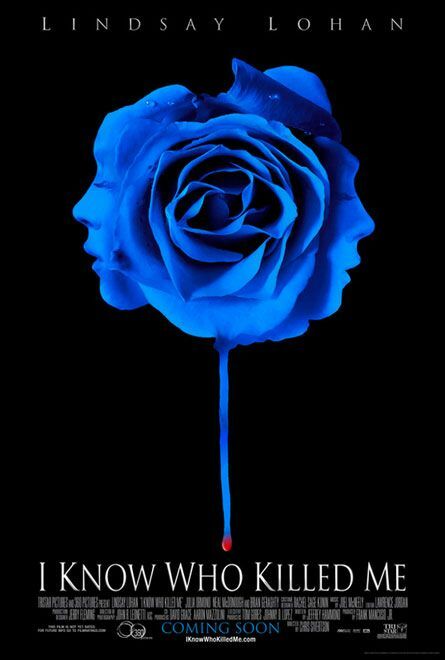 Hmm the blue glowing flower…it does look mysterious…with the blood dripping off it at the bottom…but other than that I don’t get the significance of the flower…what does it suppose to mean? This must be Lindsay Lohan’s first thriller right? The trailer is so so…has the typical trailer of a thriller look. First we meets Aubrey…then she goes missing…and when she’s found…it isn’t really Aubrey…its Dakota…a girl who looks like Aubrey ( Lindsay back to her Parent Trap days playing twins? )…Are they really twins? Different people? Or is the case of a split personality? I’m keen to watch this. I wanna know what happens. If I have to make a guess here…I think its the split personality thing. View the trailer here. Another poster out. Now we get to see part of their face. The trailer is ok I guess for teenagers. We see some pretty girls wearing some pretty clothes…talking about being BFF (I hate the stupid BFF things)…Then we meet a mean girl who shows them the cliques ( like in Mean Girls isn’t it) at school and wants to seperate them (aww…what a major disaster)…somewhere along they do join the cliques and weren’t BFFs anymore…One day all being stuck at detention…they reunite believing that they should all be themselves and BFFs again…or something like that. Frankly I’m not really interested in this little flick…but I might just watch it…just to see how bad it could be…cause it does look a little crappy. Now I’m wondering when are they going to make a live action movie of Barbie. Yes the trailer is out…well at least I think its the trailer…whatever it is…we finally get to view the clips of the movie. You can check out the trailer here. I think it looks great. The shots, the scenery and the house…or issit a mansion…wasn’t it gorgeous. The young girl who plays the young Briony kinda looks like Romal Garai who is playing the older Briony…and I think they will play the character well. I’ve said this once and I’ll say it again…I just don’t see Keira Knightley as Cecilia…Its been a long time since I’ve read Atonement…but I mean… was Cecilia supposed to be stick thin and always pouting…I don’t think so. Anyway the scenes that I’m really want to see are the scenes leading up the accusation like the fuss with the play, the dinner, the hunt for the attacker…where the course of the future is changed. It would be interesting too to see all the other important characters on screen such as Lola and the twins. Can’t wait for it to be released.